We are really excited about how quickly paddle boarding is gaining popularity. We love the serenity of being out on the water, and when you combine that with the exercise of paddling, well, in our opinion, it doesn’t get much better than that. If you are looking for a place to go to reflect on life and to clear your head, the water is a great place to do just that. As popularity has grown, innovation in paddle boarding has done the same. You can find entire kits for paddle boards that fit in a backpack. What is even more amazing is how sturdy these inflatable paddle boards are. You will notice very little difference anymore between inflatable and classic paddle board options. You will likely hear differing opinions about what the best paddle board is. The reason for the differing opinions comes down to a few factors: personal preference, what you intend to use the paddle board for, and your size. Because of these variables, and because of the questions we have received about which paddle board is the best, we decided to put together a comprehensive guide to choosing the best paddle boards for yourself in 2017. Option 1: 9'6" X 33" X 5"
The peak inflatable stand up paddle board is a great option for paddle boarders at any level. This board receives praise from almost everyone who uses it. This board is ULTRA portable and comes with a high quality carrying bag for your adventures. Portability is one of the main advantages to ISUPs (Inflatable Stand Up Paddle Boards). Check out the features below to find out why this one made our list of top paddle boards. Light Weight – This stable paddle board weighs only 23 lbs. This makes it easy to bring with you on airplanes, trips to the lake, or really anywhere else for that matter. Stability – The size of this board makes it stable on the water. It is also rigid when it comes to the makeup of the board itself. Peak has not cut any corners when it comes to using quality materials. Price – While this board is not the lowest price you will find, it is a superb value for a mid priced board. When you compare quality and price, this board is almost unrivaled! The ISLE Airtech Inflatable Paddle Board is a phenomenal option for beginners and anyone else who would benefit from a stable board. It is super portable at only 19 lbs, and can fold up completely into a bag. The stability this board provides makes it optimal for stability. Measuring 11′ long, 32″ wide and 6″ thick, this paddle board is larger than most. This is a plus for stability, but can have a negative impact on maneuverability and speed. Overall, this board is a GREAT value! Portability – Although this is one of the larger boards on the list, it is also one of the lighter boards on the list. Being an ISUP, it is super portable, especially when deflated and loaded in the travel bag! Rigidity – You might expect some decreased rigidity due to the lighter weight, but that isn’t the case here. When inflated to maximum PSI, this board is extremely rigid. Price Point – This board is moderately priced and comes with tremendous upside. For leisure paddling, beginners and those looking for a stable board, this board definitely fits the bill! The ISLE Classic Soft Top stand up paddle board is a great all around paddle board. The soft top provides added comfort for your paddle boarding adventures. The different size options for this board, and stability that it provides make it a great option for beginners, but at the same time, this board does not compromise on speed or maneuverability. This is a great option for a classic paddle board in this price range. Light Weight – The ISLE Classic Soft Top weighs in at just 24 lbs which is very light weight for a non inflatable paddle board. This makes it easy to load and unload from the top of your vehicle. Size Options – Finding a board that is big enough to be stable, but small enough to be easily maneuvered can be difficult. This board offers two size options which is accommodating for paddlers of almost any size. Price – This board comes with a mid range price tag and a high quality build offering a huge value to anyone looking for a classic paddle board. Paddle board yoga is a very fast growing practice. Combining the serenity of yoga with the serenity of being out on the water is a great combination! The ISLE inflatable yoga paddle board is a great option for paddle boarders looking for the stability needed to practice yoga. This board receives praise from a variety of users from those who are using it exclusively for yoga, to those who are using it in a multipurpose setting. Being an ISUP (inflatable stand up paddle board) means that this board is very portable. This means that you can take it with you on vacations to continue your paddle board yoga practices wherever your adventures may take you. 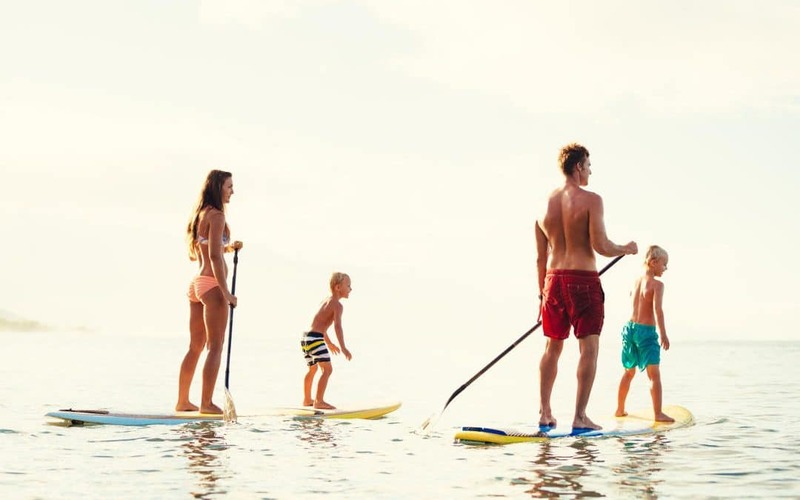 Popularity – The popularity of paddle board yoga, and the fact that this board was designed specifically for paddle board yoga are the main reasons that this board made it onto the list. Weight – Providing stability without suffering in the maneuverability department is a must. This board is one of the lightest on our list at just 18.2 lbs. This not only makes it easy to transport to your paddle board yoga destination, it also makes it easier to paddle and maneuver on the water. Low Price – Many yoga paddle boards can come with price tags up into the thousand dollar range. This ISLE yoga paddle board comes with many of the awesome features, with a much more affordable price tag. If you are looking for affordability combined with value, the Vilano Journey inflatable paddle board is a great option for you. The Vilano Journey provides you with the versatility and portability that you are looking for with most of the inflatable paddle boards, at a lower cost. Despite the lower price tag than many of the other ISUPs, this board receives great reviews from most people who have gone this route. Price – One of the more notable features of the Journey paddle board is the price tag. While there are other options that are slightly less expensive, very few boast the quality, warranty and customer service that the Vilano Journey offer. Stability – Despite being one of the smaller inflatable stand ups available, the design of the journey allows for great stability for riders of any experience. Maneuverability – Although there are boards on our list that are lighter than this board, it still weighs in at 24 lbs which falls into the ultra portable category. Since this board is a shorter board, many people find that it maneuvers more easily than some of the longer boards. The stability and maneuverability make this board a great option! Many people love being able to take their paddle board wherever their adventures lead them. If you have a classic paddle board this can be quite difficult. Portability is one of the main reasons that inflatable stand up paddle boards have become so popular. We love the aspect of portability which is why we have put a lot of research into our choice for best inflatable stand up paddle board. Here at The Small Boat Shop, if we had to choose one inflatable paddle board for all of our adventures it would be the PEAK Inflatable Stand Up Paddle Board. This board is at the top of our list because of the durability, versatility, portability and price. If you need one board for a number of adventures, this is a great choice! If you are an avid traveler who loves to bring along a paddle board, or if you are a weekend warrior who loves paddle boarding, but who doesn’t have a vehicle that can haul a large classic paddle board, the inflatable paddle board is an ideal option for you. Yoga? On the water? Yes please! If you have not yet had the privilege of participating in paddle board yoga, you should definitely give it a try! The added balance aspect provides for an amazing workout and the relaxation that comes from being on the water while performing yoga is almost unparalleled! Our selection for best paddle board for yoga comes from personal experience, feedback from friends and acquaintances, and even paddle board yoga teachers. The ISLE Yoga Stand Up Paddle Board is our top choice for paddle boards for yoga because of its durability, stability, affordability and portability. This board can go almost anywhere with you as your sidekick for your yoga practice. If you are paddling, you are getting exercise. The difference in the exercise that you get will come down to duration (how long you paddle for), resistance (how much you weigh and how much the board weighs) and balance (how sturdy the board is on the water). In our experience, you are going to get the balance aspect of paddle boarding on any board. This means that the best paddle board for exercise will be one that is larger (more resistance) and one that allows you to paddle for longer. Our top selection for exercise paddle board is the ISLE Inflatable Stand Up Paddle Board because of its size, stability and price. If you want a board that allows you to get out on the water for a long duration, this board is a great option! It is a large inflatable paddle board that offers a lot of stability. This means that you can paddle longer, which in-turn means more exercise!